Using chair cushions with ties is an economical way to give your kitchen or dining room a face-lift without spending hundreds of dollars on remodelling. Simple and elegant, these chair cushions can add a splash of comfort and color to those wooden and even vinyl chairs. Chair cushions with ties can even be used in the patio or sun room to add a little interest to those plain jane chairs. Unfortunately, there are so many different companies that make dining and kitchen chair cushions with ties, and each company makes such a huge variety of these cushions, that reviews for any specific cushion are few and far between. So we have tried to choose an interesting selection of indoor chair cushions with ties for this review. Brentwood Suppliers manufacture and sell a wide range of high quality chair pads for the kitchen, dining room, patio and porch. These chair pads run from quite neutral colors to bright and dramatic cushions. The Brentwood Tapestry Floral Chair pad is perhaps one of this company’s most beautiful and sophisticated chair pads. The Brentwood Tapestry floral chair pad is sure to add a touch of color to any room it graces. The Brentwood Tapestry floral chair pad would be a perfect chair cushion for either the kitchen or dining room. In the kitchen, this chair cushion would add a bright touch of color and warmth, particularly to those kitchens that are mainly white and stainless steel. They also would brighten up any dining room and add a bit of sophistication and dramatic flair to those dining rooms that tend to dark. Paired with a red tablecloth, they would help provide a perfect backdrop for a well decorated table for those special occasions. We found a number of reviews for the Brentwood tapestry floral chair pad can on the internet. The reviews are all extremely positive, giving this chair pad with ties impressive ratings. While some customer did state that they found this chair cushion too thick (about 5 inches instead of 3), other customers stated that once you have used these cushions for a short while and the filling settles, they are only about 3 inches thick. Overall, most customers didn’t have anything negative to say about these chair pads, and they found them to be exactly what they wanted and needed. Made in the USA by the Georgia based Barnett Products company, who have built their reputation on creating soft home furnishings, including chair pads, window treatments, table and bed linens, that add a touch of hospitality and charm to any home, the Tufted Nine Tack Chair pad is a chair cushion designed to provide for a comfortable seat, regardless of how hard the chair under the cushion may be. This striped chair cushion will add a touch of quiet color to your kitchen or dining room. These cushions look both stylish and modern. There seems to be no reviews for this specific chair cushion with ties at present. However, after scouring the net, there does seem to be a few scattered reviews for other chair and bar cushions made by this company, and those reviews are quite positive. It should also be noted that this specific type of chair cushion comes in a variety of other colors as well. If you are looking for a chair cushion by this company with more vibrant colors, you may like the Toplar Cafe Stripe, the Claret Stripe or the Moire Melon Plaid versions of this chair cushion. 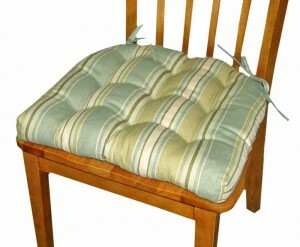 One of the most attractive chair cushions with ties is the Victoria Park Toile Cushioned chair pad. This pretty country style cushion has plenty of nice features. The Victoria Park Toile chair cushion with ties is a beautiful and well made chair cushion that can add a touch of elegance to the dining room or even the kitchen. Many people will love the fact that this cushion is made in the USA. Reviews for the Victoria Park Toile Cushioned Chair pad are excellent. One customer did state that one of the ties on the cushion broke, but that seems to be the only complaint involving this cushion. This beautiful chair cushion will brighten up any straight back dining chair that you own.